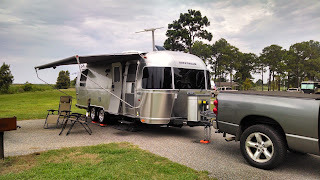 TinCampers: Our first camping trip. We are headed out for our very first real camping trip. We will be traveling a stunning 12 miles from our house to Meaher Park which is located on the causeway almost to the other side of Mobile Bay. A really nice state park right on the water. Lots of wildlife, including gators! Unfortunately, I don't know what happened to the rest of our pictures!